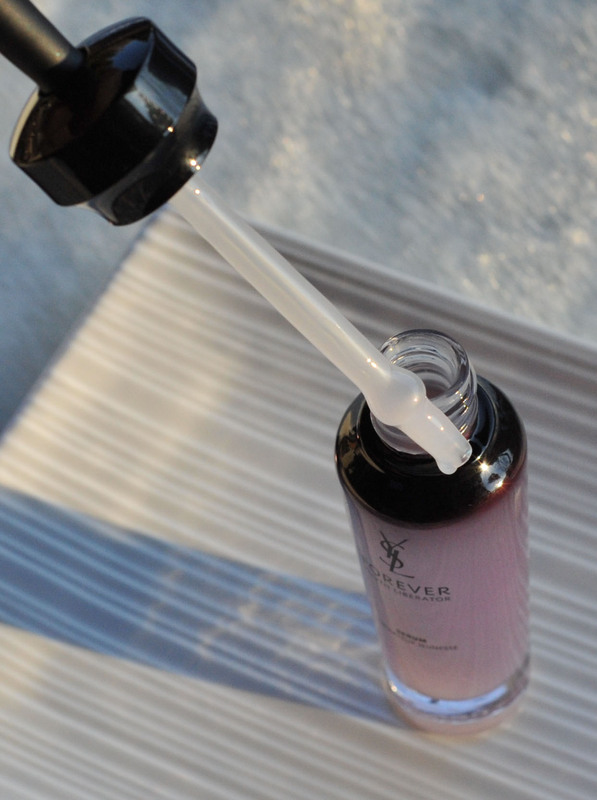 I was at the YSL counter to check out their new “Vernis à Lèvres” and I noticed this new Forever Youth serum. They insisted that I should try it, that it was “so” special and “so” innovative and they gave me a tiny sample. I have always been looking for great products for my skin but since my skin is so incredibly dry it has been very difficult to find the perfect combination. “Yves Saint Laurent’s Forever Youth Liberator range is an innovative new line of skincare products that focus on glycobiology and the discovery that with age the number of glycans in your skin actually diminishes, which leads to the ‘locking’ of the cells and eventually delaying the skin’s regeneration. I have extremely dry skin, I finally discovered a skin moisturizer that worked for me only 2 years ago (Laura Mercier Repair creme). Before that, I could not even wear foundation at all and I had to reapply moisturizer every 3 hours. I have tried a lot of serums and moisturizers from different price ranges but only a few worked and they were really expensive. I consider Laura Mercier and YSL “middle” range, expensive of course, but I can understand paying more for better products if the results are good. Cle de Peau and Chantecaille have great products that would certainly work for me but the price range is much higher and I never had the opportunity to try them correctly, a tiny sample is not enough to see if my skin will tolerate them. I have to use them for at least 5 to 10 days before seeing any reaction. The serum bottle has a dropper, you need 2 drops for the entire face and neck as per YSL recommendations. I like that it is hygienic and easy to use and you will never touch the product. The Nutri creme comes in a pot, they provide a little spatula that you will use to pick the correct amount of product for the entire face and neck application. It took me a couple of times to dose the correct amount of product I needed. The first day I tried only the serum at night, I felt my skin was really soft afterwards and my interest was piqued. Second day, serum morning and night, always before moisturizer. Third day, serum morning and night. That evening I remember I told my boyfriend “I think I need this…. ” I loved how my skin felt. Forth day, I went back at the YSL counter, asked for more samples of the serum and asked them if I could try the moisturizer as well. This was to check if the combination of the two was really adapted to my skin. Since the serum felt so good, maybe I should try the rest of the line… Went home with 2 little serum samples and a sample of their Nutri creme from the same Forever Youth line. I tried these together for over 1 week and loved it. So far so good, no dry patches at the end of the day, no breakouts and I can wear foundation on top. My skin feels extremely soft and velvety. I also can see more radiance but I need to use this for a longer period of time because 7 days is clearly not enough. By the way, the smell is soft and does not bother me at all and it does not stay on my skin. After 7 days I bought the serum (30 ml) and the Nutri creme. I also received a gift with purchase which was a mini serum (15ml) not so mini after all… a great gift ! Even though I like it, I need to wait some more weeks before I can see how well it performs and if this is really what my skin needs, sometimes when I try new skincare, it is only after a few weeks that my skin starts to show dry patches even if I exfoliate regularly. I will update this review in a few weeks with a status on the results. You may want to try a sample of each product just to make sure before you invest. I am using both the serum and the Nutri creme, morning and evening. So far, my skin feels soft, but, I am not sure that the creme is enough for me, as I said, my skin is extremely, really extremely dry, no dry patches yet but I can see some light peeling on the side on my nose.. not sure what is causing it so I will carry on using these products and will update you regularly. I have been using both products for a month. Although I like the smooth feeling on my skin, the Nutri cream does not provide enough moisture to keep up with foundation during the day. If I wear foundation on top of this Nutri cream, after a few hours I start to notice dry patches and some peeling. If I wear my Laura Mercier Repair creme (the one without spf) during the day and with foundation, the moisture lasts all day long. At night I apply the YSL serum and the Nutri cream. In the morning and when I want to use foundation, I apply the YSL serum and the Laura Mercier Repair creme. Keep in mind that my skin is extremely dry, much drier than any “average” dry skin. 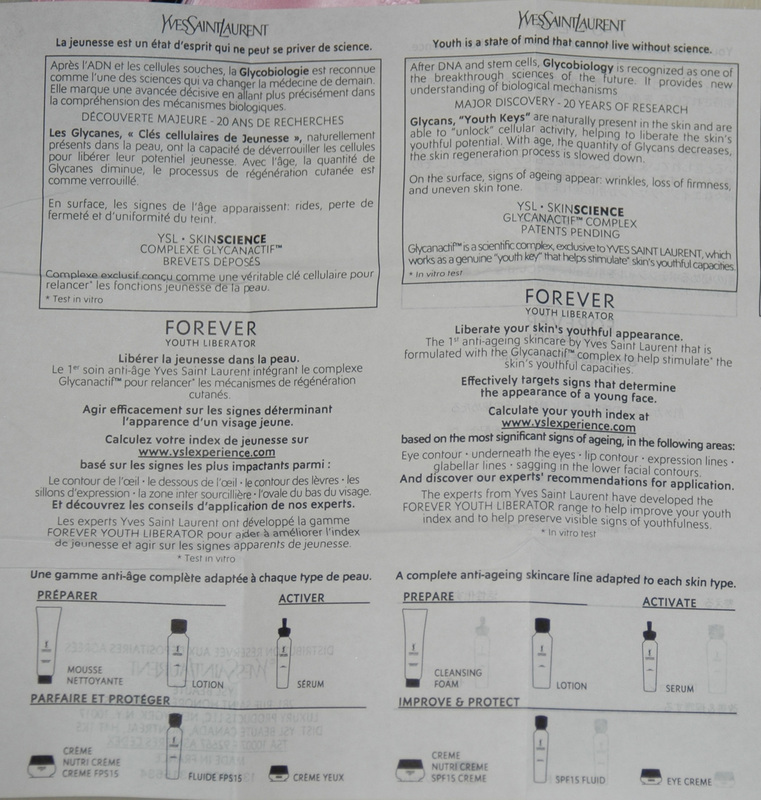 Yves Saint Laurent Forever Youth… my first impressions was last modified: February 28th, 2012 by Sonia G.
hi there! 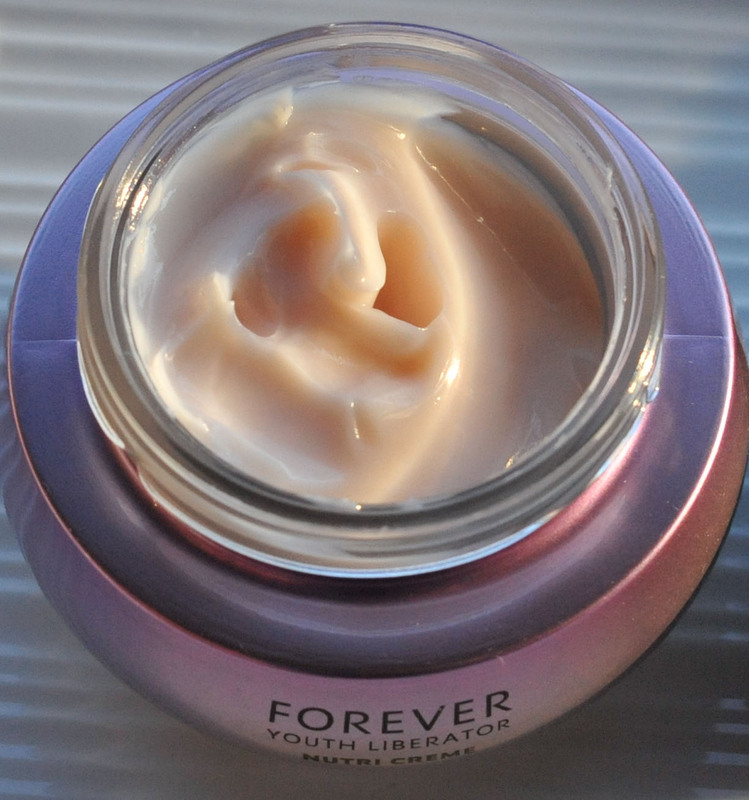 I just saw your review… i’m really loving the YSL Forever Youth Liberator series! Too bad the nutri cream is not rich enough for you though… have you tried moisturizers with hyaluronic acid? That’s supposed to help trap and deliver moisture to your skin. let me know what u find!! have you ever seen the dermatologist about your skin or had a microdermabrasion? I am in my early 40’s. I have sensitive/dry skin. seems the last 4 months my face has become drier, flakey, allot of redness. I start microdermabrasion next week. As been having a heck of a time with foundations so i just skip them all together. I am using a loose powder from smashbox, the hydrating one and it looks okay. i really need to find the right skincare regimen. I hope the microdermabrasion helps me! Also, soemone next time I see my dr. have them check my hormone levels as I am told that can be causing issues with my skin. Let me know how it goes, I never tried it but I am very curious about it. what foundation do you have the best luck with? right now I find the Tarte, amazonian clay one masks my redness and never looks flakey or dry on me? i am wanting something more sheer and not having any luck! :(…..i always ask for samples as I had boughten the Hourglass tinted moisturizer along with a primer , (recommended by the Hourglass rep. of course). Naturally it looked good when they put it on me but after a few hrs. it settled into every single fine line and showed every single dry spot on my face! We seem to have similar skin types and I will keep you updated on what my derms office recommends for treatment! my fav is Ellis Faas, By Terry (some of them), Tom Ford, they don’t deliver a lot of coverage but they are very comfortable. Then the ones I love with a tiny bit more coverage (but my skin has to be really happy and moisturized) : Burberry and Chanel Aqua. Today I am wearing Chanel Aqua, I love it but I need to make sure I was able to use the Laura mercier for night and for day generously. my skin care is Laura Mercier Repair (no spf), and Fujifilm jelly, if I don’t use the Laura Mercier I am definitelly in trouble and can’t use foundation at all. Hi Sonia. So i went a NARS event at a local salon by me, they had an artist from NYC come. I tried the skincare line, I’m always hesitant and don’t have much hope as seems lately nothing works for my dry, sensitive, red skin. Well, I was very impressed. I ended up getting a serum, the optlmal brightening concentrate and LOVE LOVE it! I used it at night and again this AM and it really does seem to help sooth my skin. I also tried NARS tinted moisturizer and it looked amazing. it did not seem to cake or settle in any fine lines or show and dry patches. The next thing i want to get is the toner. not sure if you have already tried these? If not maybe they will give you some samples to see if you like them. I’ll keep you updated on the micro-dermabrasion when I start. I’ll take before and after picture. I have tried one of their “very moisturizing” creams (luminous moisture cream), that did not work for me, it was pleasant to wear but not for all day, my skin needed “more comfort” but my skin is hell, so not a reference. I haven’t tried the toner so I can’t tell. I just use Bioderma, I guess I should use more skincare but since there are many brands I want to try that are available in Japan, I’ll wait for my trip and get a few toners and creams. 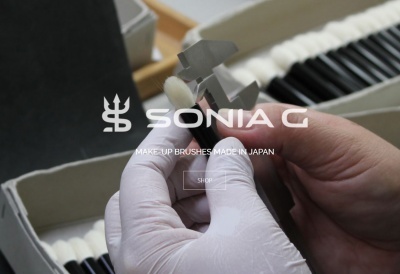 Sonia- yes, i will keep you updated on searching on the right skincare- the lines on my forehead are really prominent now and self conscious about them. I am also going to ahev my hormone levels checked as a friend said it could be that I am in peri- menopause and our skin gets very very dry. 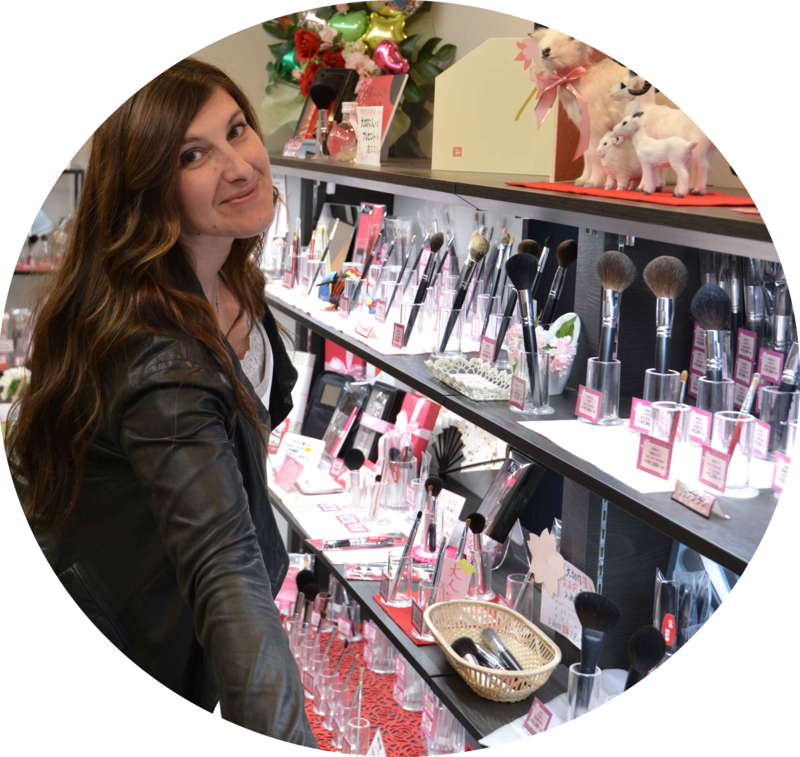 SIGH….i will have to see if I can get a sample of the Laura Merciere cream you use before I drop the $95.00! I’m eying some of the Suqqu blushes you showed along with RMK and sadly USA stores don’t carry them along with some Shu Umera lipsticks so hopefully can order! And I will let get back to you once I take the pics to send you for comparison. …have a great weekend, hopefully it will be sunny there and warm! but it doesn’t work for me, it doesnt mean it will not work for you though ! don’t know about Delicate Hummingbird… 🙁 well, I know her but I don’t know if she is taking a break. I can’t wait to hear your final opinion and the pics. 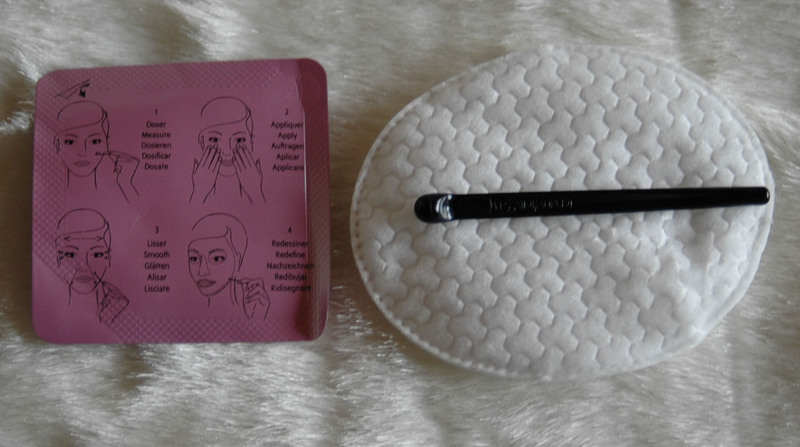 Going to do some kind of work on my face is something I should do but I remember my best friend offering me some treatments for my 40th birthday, it was horrible, they worked on the pores and it was really really painful (it was electric but I don’t remember the name). so happy you enjoy this community 🙂 the input from all is always very helpful since we are all so different ! Used this for a week and my skin turned white and very sensitive. Sure it feels better but at what expense! What am I going to do with the white skin? If you are not happy with the product, please go to the counter and explain your concerns, they need to help you. There is no other way to deal with it. Have you ever tried Kanebo Sensai cellular performance skin care? My mother uses the serum (nr III) for her dry, mature skin. I once borrowed it when I ran out of my moisturizer and woke up like a burn victim from the intense moisture properties (I have combination/oily skin). It was scary… But for someone at the other end of the extreme, it sounds like a fabulous line of products! You may just be the perfect candidate! Also, if you haven’t, you should try the YSL Teint Touche Eclat. I bought it before knowing enough about skin types to avoid it, and that stuff is beyond moisturizing… I wanted to peel my skin off it was so flared up red and oily as a result of the foundation. And now with dry skin, it’s nice, but it stays dewy, even if I powder intensely (and stays sticky, which is WHY I powder like a mad woman), all day long. The coverage, as I like to say, is sheer to none, but that depends solely on the dryness of the canvas – the drier the skin, the more coverage it gives ;). thank you Olga, I will definitely try it then, I think we have Kanebo here for the skincare range. That’s for sure I am the best candidate 🙂 if any high end brand wants to take me as a guinea pig I am ready for them by the way 😛 I challenge them to find me the best skincare. I have the YSL, works nicely, I prefer the Burberry since it’s very similar but delivers a bit more coverage. The grass is always greener on the other side :D! I “borrowed” some of that emulsion last night to apply to my now dry skin and the result is of course the polar opposite to what I previously experienced. Absolutely no irritation, absorbed fully and woke up with silky skin. So yes, do check them out and experiment ;). Good news !! I went to the Kanebo counter today because I wanted to get the Sensai eyelid base, following to a recommendation of Buggsie and because I want to compare the current Tom Ford eyelid base from fall with something similar in price, one stone two birds 🙂 or three ? because I was given a sample of the Sensai Emulsion II and the hydracharge essence ! so I will be able to try these tonight ! Yeah… But to be fair, at least where I live, they don’t make a lot of money, the sa’s or the actual brands. I spoke about this to one of the better ones, and she said the department stores here keep them around “for the prestige”. But of course that’s not the case in other parts of Europe, Asia or the US, because when dealing with what essentially started out as a clothing line, whether couture or pret a porter, what actually makes the most money is the cosmetics lines and perfume. By comparison, they’re the most affordable products. They didn’t have the III unfortunately, but I will try this one too. Oh going to Japan has been a dream of mine for a long time! Of all the Asian countries, it’s the one that fascinates me most. The fact that despite a large population and a geographically complicated location, overcoming catastrophic cataclysms, both natural and man made, in recent history, they are easily the most prosperous Asian country. Their culture is so interesting, despite a lot of it originating from China, but hey, fine example of what a difference in character will result to in the future. The traditions, the art, the sense of honor and hard work… Ugh, love it all! And sushi, I like sushi too :). I grew up with Sailor Moon as my hero and would imagine I was there with her in Tokyo fighting intergalactic evil in awesome outfits ;). And of course their art of silk and textile is nothing short of awe-inspiring. I have always been scared of Asia because of the culture difference, the traditions I mean and the rules. BTW, notice how this has become my thing? Digging up old posts and creating fresh buzz around them ;)? you’re hilarious 😀 I can see that !!! Actually, I didn’t dig up this post as randomly as you may think. I’ve been playing around with making my own foundation. I have the ingredients to make the perfect colour, now the problem is, making it look good. All but one of the parts are geared towards oily skin – the texture is dry, matte and opaque. Now, my skin isn’t scary dry now – with the exception of my lips and hands (which looks like someone tortured me with sandpaper unless I slap animal fat ointments on them constantly), but unless I use something as crazy luminous as the YSL on it’s own, it LOOKS dry. Either immediately or in a few hours – just cracked and dry. And I can’t increase the proportion of the luminous part because it would have to be so big, it would cancel out the colour correction. I know it’s not really the foundation’s fault, it’s my skin. So I’m looking for ways of prepping it properly so I can actually wear my long brewing experiment. I mean, I already wear it, my skin just isn’t doing it much justice. It could look much better. That inspired me to revisit the Kanebo emulsion, see how my skin likes it. Then I remembered this post and what an absolutely horrid reaction i had to the emulsion with oily skin, and thought “Oooh! I bet Sonia would love this!” :D.
Anyway, I personally am not going to stick to using it. It’s a bit too expensive for me, and it would involve my stealing it from my mother, and I don’t want to do that – it’s like her only little pampering joy. I know how you feel, at some point it’s too oily, at the next it’s too dry… finding the right balance is not only a matter of skin “location” but it changes for me on a very regular basis too (well only from “freaking dry” to “very dry” anyway but if I put too much moisture I reflect the moon light). I have been trying a few home made recipes but the problem is that I am lazy… so at night if I have to spend more than 5mn with the clean-etc routine I will not have the patience to do it every day. I’ll be very happy for you if it works, because although it’s great you finally found the LM, there is such a thing as skin (the body in general) adapting and you may find products stop working. I think it’s perfect to have 2-3 products that do the same thing and work for you and keep them in rotation, keep your skin guessing ;). For example, one of the biggest changes I made in skincare recently after years and years of no change at all, was stopping to use the Neutrogena toner for acne prone skin, which was stripping my skin and making it worse. I switched to a gentle Garnier toner and although it didn’t seem at first to do anything, because it’s so gentle, over time it made me change how I see this particular step in skincare. I know exactly what my 3 toners in rotation would be in the perfect world – the Garnier (drugstore), a homemade one with peppermint, green tea, jasmine and vinegar (really want to try make this when I have some time off) and the Kenzo Ki bamboo water (one high end too. Omg, had an ancient sample and it feels like standing on a cliff and having cool mountain air blow in your face! Alas, I can’t get it here anymore and it’s REALLY pricey… But someday definitely!). Actually, skincare is the one subcategory of beauty I’m not nuts about wanting the best of the best in. I think it’s much to do with skin type too – luxe companies tend to focus on dry skin and anti-aging and even the lines that are supposed to work for younger skin with problems more along the lines of what I experience, I just don’t like them. I’ve tried Clinique and Biotherm, and even their special creams for oily, acne prone skin feel thick, greasy and unpleasant to me. So at least with this, I don’t feel like I’m missing out using Garnier, Neutrogena, Clean and Clear or my own concoctions of olive or coconut oil from the kitchen :). AND…..back to the YSL…..I’ll be getting the new serum foundation today which is based on the forever youth range, so I’m hoping for a winner!! let me know how you like the YSL, I am very curious and really want to try it! I hope I will be able to see it next week in Geneva. NO WAY!! Snow already?! OMG that’s a dismal thought. It’s been raining here but I still live in hope that we will have some warmth again before Winter kicks in. I ordered my YSL foundation from the US because for some very peculiar reason we are not getting the BR40 which I assume to be a good shade for me. It had better be good after all the hastle of getting hold of it! I’ll let you know. I am thinking I should share a pic of my house in renovation… you would be SCARED !!!! Nope, I scrounge samples off ebay!